On the crowded, noisy street of Pyay Road in Yangon’s Ahlone Township, locals regularly shop at nearby stores while cab drivers sit in standstill traffic. 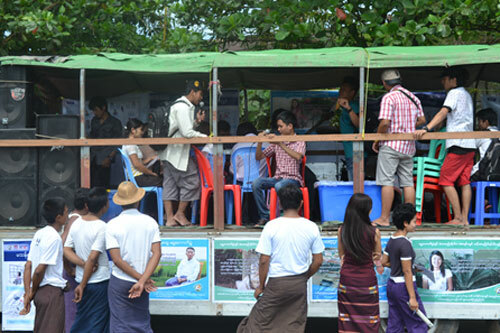 On October 30, eight days before Myanmar’s historic 2015 general elections, however, the atmosphere was a bit different, as passers-by were greeted with live music and voter education materials. This event was part of a multi-day, mobile get-out-the-vote concert organized by the International Foundation for Electoral Systems’ (IFES) local partner, the Myanmar Independent Living Initiative (MILI), a disabled persons’ organization (DPO) that led a campaign to inform persons with disabilities about their right to vote and to encourage them to cast their ballots on Election Day. Disability organizations have highlighted the obstacles that voters with disabilities have faced in the past, with many persons with disabilities being left out of previous elections. In the lead-up to Myanmar’s 2015 elections this reality has started to change thanks to DPOs such as MILI taking an active advocacy role. From October 29 to 31, in Yangon, MILI members drove around an open-bed truck with a band composed of a drummer, two guitarists, a bass player, a keyboard player and several singers. Lined with voter education posters, the truck stopped in six townships where the band – whose members themselves are voters with disabilities – performed popular songs to gain the attention of passers-by. After performing the first few songs at each location, MILI spoke to voters about the elections, providing information on voting and polling procedures as well as emphasizing how voting empowers citizens and allows them to have a voice in their country’s future. 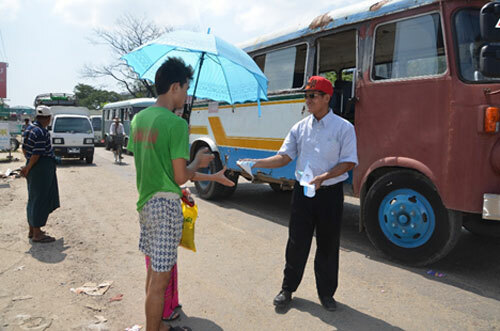 Over the course of the three-day event, volunteers also distributed 4,000 voter education pamphlets. One pamphlet outlined information on polling procedures for voters with disabilities and highlighted the different types of available assistance. A second pamphlet described the step-by-step process of voting and illustrated the process with animations of voters who are blind, wheelchair-users and deaf. A member of MILI distributes voter education pamphlets during a concert. The townships that MILI targeted during this event are among the 15 townships where the Union Election Commission (UEC) piloted more accessible polling stations on Election Day. At these polling stations, which were located near schools and hospitals, the UEC deployed polling officials who had received disability access training from MILI and other DPOs, while voters with visual disabilities were able to use braille ballot guides when casting their ballots. These guides allowed voters who are blind to cast their ballot independently and in secret. This pilot project is the outcome of IFES-sponsored consultations with the UEC. 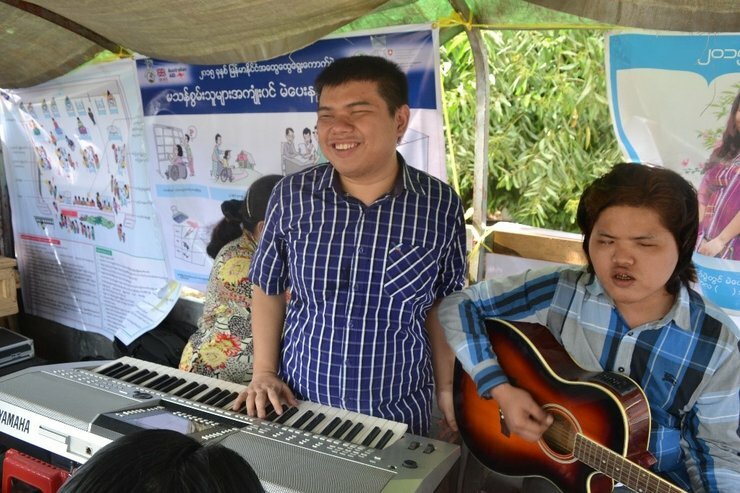 The mobile voter education concert is only one of many disability inclusion activities that MILI has conducted for the 2015 elections. Between September and October, MILI developed a how-to-vote guidebook for persons with disabilities; broadcasted voter education programs on Myanmar radio and television in sign language; and helped train 220 election officials on accessible polling procedures as part of the UEC’s poll-worker cascade training program. In addition, MILI has provided recommendations to the UEC on the legal framework for elections. As the MILI band performs, passers-by stop to listen and read voter education posters. IFES supports MILI’s election programming under the “Support to the Electoral Process in Myanmar” program funded by the Australian Department for Foreign Affairs and Trade, the UK Department for International Development and the Swiss Federal Department of Foreign Affairs, and under the “Elections and Political Processes Assistance” program funded by the U.S. Agency for International Development. Originally published on www.IFES.org on 09 November 2015 and reposted with permission.